Your home bank likely charges a foreign ATM access fee. This fee varies between banks, but everytime you use your card at a foreign machine, your bank makes a healthy commission. A trip where you might use your ATM card 10 times could cost you about USD 50 in bank fees, not including the foreign currency conversion fee. There are two major 'systems' out there. Pull out your ATM card and have a look at the back and you'll likely find either a 'Plus' or 'Cirrus' symbol. Plus is more common and is owned by Visa. Cirrus is owned by MasterCard. When using an ATM, the ATM needs to be on the same network as your card. If not, everything will seem good when using the ATM (it accepts your card, you enter your PIN, and so on), but no cash will be dispensed. Some ATM's are linked to more than one network, but not all. ATM cards are easily compromised if your PIN is observed by someone else. Always check the machine out before putting your card into it. A card reader in front of the slot and a little wireless camera above the keypad can capture all the information about your card and a new card can be produced to drain your bank account. We always check the machines, regardless of where we are, including the ones at home. If in doubt then do not use it! PIN's need to be 4 characters long. If you have a different length PIN then make sure to change it to 4 characters as many international machines will only accept a 4 character PIN. Also, if you have your PIN memorized by letters, not numbers, then time to memorize the numbers instead since many foreign machines do not have letters on their keypads. At your home bank, you need to inquire what your 'default' account is. Many of us have several different accounts with one bank, but you likely only wish to withdraw on your ATM card using one account when traveling. Set whatever account you plan to draw funds from as your 'default' account. This is important as many overseas machines DO NOT give you an account choice and will pull money from your default account. Also be aware that in different countries accounts are called different things. Sometimes your default account will not say 'Savings' or 'Checking', but rather 'Current Account'. Of course, your Checking account may also say 'Chequing' too. Be prepared for this surprise when using overseas machines. Contact both your bank and your credit card company and let them know that you plan to use both your ATM and credit card card overseas. Sudden changes in your account activity, such as frequent withdrawals in a foreign country using your ATM card or a new charge on your credit card from a foreign country, can sometimes trigger a fraud alert and cause your bank or credit card company to block account access. Ask your bank what your daily and weekly withdrawal limits are. This is particularly important if you are traveling somewhere that is expensive (e.g., Japan, Europe). If you can, increase your daily and weekly withdrawal limits. ALWAYS get a receipt from the machine. You may need it later to prove to customs that you used money in the country. You may also need it to back-convert extra money at the end of your trip. And finally, DO NOT look at your account balance at the bottom of the receipt. Not all receipts will give you this information, but if it is given it might be converted to the currency of the country, it might be in your home currency and have extra decimal or commas placed it in and so on. All of us have had panic attacks when receipts have shown an account balance of USD 4.32 left in the account and two more weeks of travel to go! If in doubt, sign up for internet banking to check your balance while traveling. 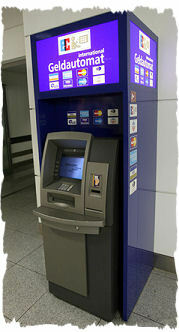 Although the word 'ATM' is well known, also knowing the local term will help, especially if you are trying to find one. Some other names include: Automated Transaction Machine, Automated Banking Machine (or ABM in Canada), Cashpoint (in Britain), money machine, bank machine, cash machine, hole-in-the-wall, Bancomat (in various countries in Europe and Russia), Multibanco (in Portugal), and All Time Money (in India).